I spent a lot of time yesterday thinking how I could change chocolate chip cookies into S’mores cookies. You’d think it would be easy, right? Add marshmallows and milk chocolate to a dough. But no, both of those things tend to dry out when baked for over 5 minutes. So I tried making the cookies two ways. First, I made a graham cracker chocolate chip dough and buried frozen marshmallows inside the dough circles. My thought was that if the marshmallows were frozen and buried, they’d have less exposure to the heat and dry out less. This worked pretty well, but the marshmallows still added a chewiness, which wasn’t necessarily unpleasant, but not particularly great. For the second version, I baked the cookies for about 9 minutes, then ever-so-quickly stuck marshmallows and Hershey bar milk chocolate pieces in them before returning them to the oven for another 3 or 4 minutes. Here’s what the second batch looked like. They are so good! Below is the revised recipe. In this shot, the marshmallows are a little bubbly and hot. They settle down nicely once cooled. 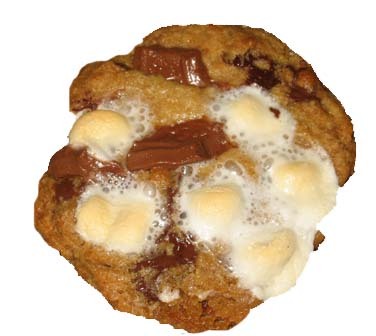 S'mores Cookies are chocolate chip cookies with graham cracker crumbs, marshmallows and bits of Hershey Bar on top. Preheat oven to 375 degrees F. Line cookie sheets with foil. In a mixing bowl, beat together butter and sugars until light and fluffy. Blend in egg and vanilla. Combine the flour, crumbs, salt and baking soda and add to the creamed mixture. Stir until blended, then mix in chocolate chips. Drop dough by heaping tablespoonfuls onto cookie sheets about 3 inches apart. That’s awesome! You must be a great baker, and I’m glad the recipe was a success. Just needed to let you know how popular these cookies are with friends, family and strangers! My nephew and his college hockey team love them! By request, I’m baking 144 of them for each away game and enjoying every minute of it. I made these cookies for a highly competive cookie exchange and WON BEST TASTING!!! I’m in high school and my mom has an annual cookie swap at work. It’s always hosted at our house so I thought my cookies had to be amazing. I tried this and the adults thought they were okay but I had 3 extra dozens. What did I do? Brought them into school. I am not known as the girl with the s’mores cookies and I am asked weekly when I will bring these next! People I don’t even know the names of ask me about my amazing cookies. Thank you for this amazing recipe! Sorry about the “hot mess”. I’m not sure what went wrong because this recipe always gets good reviews. Also, if you halved the recipe then the correct amout of baking soda would be 1/4 teaspoon since I used 1/2. It’s possible it was the baking soda, but probably something else. Did you use something other than butter (a spread, maybe? ), not use enough flour (I didn’t put a weight, so maybe your cup was lighter than my cup). Also, is it possible you forgot to halve one of the the sugars or didn’t halve the butter? Many times while halving a recipe I have mis-measured the butter or forgotten to halve the sugar. Too much sugar and (sometimes, not always) too much butter can cause spreading. Feel free to email me if you want to try again. We can trouble-shoot together since this is generally a pretty safe recipe. Im not exactly sure what I did wrong with this recipe other than halveing it but these cookies turned into one hot mess for me. They spread so far into one another and were extremly thin. Wonder if 1/8ts just isn’t enough baking soda…hmmm. They tasted great though I will say that… I dug right into my thin hot mess cookies lol…do wish they had a little more graham flavor though. Yikes! Sounds like your oven is running hot or something went wrong while mixing. 375 should be fine for normal ovens, but lots of ovens run hot. I’m glad you didn’t bake all the dough at once. If it doesn’t work the second time, then something went wrong when you were making the recipe. Feel free to email me if you have any questions, but this recipe is usually a success. I’d be happy to help you troubleshoot. 375 burned the cookies to a flat mess and stuck to the pan. I am making a second batch reducing to 350 and chilling the dough for 20 mins to see if this will help. I really want these to work. Mine look like yours!! and they are out of this world delicious! Thanks! These are so good!!! O-M-G! Thank you for putting these cookies together. I’m eating them right now, and I’m sort of regretting that 1) I made these; 2) There are more in the kitchen; and 3) I live alone. *sigh* Good thing I halved this recipe! I only had big marshmallows, so I cut them into four parts. It worked perfectly. WONDERFUL!!! I promise to pass this recipe along to others!!! I just made these and wanted to let you know that they are great! I used my new cookie scoop and got exactly 3 dozen. That never happens when I make cookies. Great recipe! Thanks. Oh, boy those are exactly what I was looking for…LOVE the photo with the warm melty marshmallows. I made these today and they were fantastic, thanks so much for sharing the recipe! I posted about them on my blog with pictures. Thanks a bunch! What did the added milk do for the cookie? The miniature kind as opposed to the big fat kind. I checked and the minature ones are called jet-puffed too. I thought only the fat ones were jet-puffed. The recipe states NOT Jet puff marshmallows. So what kind do you use? I think you might have scooped the flour a little heavier than I usually do. What I do is spoon the flour into the cup and sweep it across the top. In more recent recipes, I usually note that or put the weight of the flour. Do you have a kitchen scale? If so, you might want to try making the cookies again and using a little over 5 1/2 oz (by weight) of flour. Ok, I made these last night and my dough seemed very dry, I had to knead in the chips. I loved them and will try them again but probably with less graham crackers as mine had too much of a graham cracker taste and cook about 350 degrees. When I cooked them at 375 they seemed to get burnt quickly so I cut down on the time. Did not know if I did something wrong but were still great! Just know I could do better! Tollhouse proportions are pretty different, actually :). 3/4 cup both sugars, 2 eggs, 2 1/4 cups flour, 1 tsp. each soda & salt……very different. Brockdiva, I was happy with these when I made them, but if you like more of a graham cracker flavor, you should definitely play around with the recipe. Your idea to add chunks of graham crackers is definitely a good one. If you improve the cookie, let us know. Thanks! I thought these looked beautiful once baked but I was hoping for more of a graham cracker taste. is it possible to add more crumbs and less flour or wouldn’t that work out? or could I put chunks of graham crackers in the dough? I have bought s’mores cookies made by my local grocer and they taste very “graham-y” more authentic to the s’more flavour and I’m hoping to duplicate that…. on a side note however, my kids loved these cookies. My 3 year old said they looked pretty! my hubby calls them campfire cookies. thankyou for sharing your recipe. One of the best cookie recipes I’ve baked. These don’t last more than 24 hours in my house. I stumbled onto you blog looking for a smores cookie (not a bar). I tried these and they are FANTASTIC. These are my new all-time favorite, and a new family request. I spread the word to several friends and they all loved them too! Thanks! 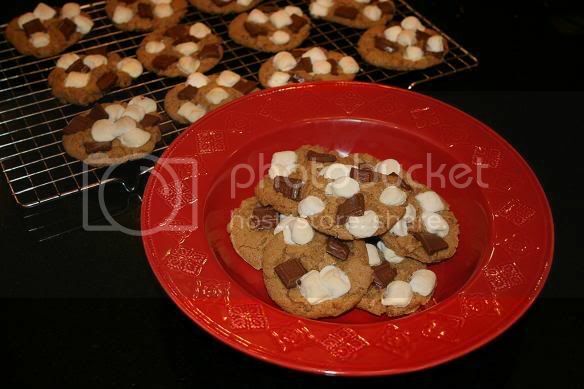 Thanks for the recipe- I had been looking for a Smores cookie recipe and this one is great. Thank you for sharing the recipe; my modification is finely cut up chunks of fancy chocolate vs. the Hersey’s and/or semi-sweet chips. Also a spoonful or two of Nutella also seems to win praise. Here’s some pictures of my 3rd batch. Mental note, if you run out of graham crackers – substituting with with a honey-like cereal, say Kix.. doesn’t quite work, they come out coated with a cereal taste but still edible. Thanks for the picture. Those look great! Yours look better than mine. Also, I’m glad you felt proud of you work. I still get that feeling when I try something new. I made these cookies tonight–they took about 30 minutes start to finish and they turned out great. I subbed millet flour for the white flour and crisco for butter, just because that was in the kitchen. The link on my name is to a pic of them, I was ridiculously proud of how well they turned out! Thanks for the recipe! I need to make these again. Haven’t made them in a while. The S’mores cookies were spectacular and very easy. They didn’t take long and they were just excellent! By nature, blogs are chronological. At least they are supposed to be! To view mine chronologically, you’d have to click on the banner at the top to get the main page. That will put you where we are today. To view from the beginning, go to the archives located on the right side bar. Thanks, Is there a way to view this in cronological order? I’m new to this—saw it on the Food Network when the Bakeoff was on!!! THESE LOOK SOOOOO YUMMY!! Enjoyed you on the Bakeoff…Congrats!!!! Thanks, Anonymous. These were really good, I have to say ;). What a great idea! It looks good all bubbly and gooey like that.